Abstract: We present a new globally smooth parameterization method for surfaces of arbitrary topology.Our method does not require any prior partition into charts nor any cutting. The chart layout (i.e., the topology of the base complex) and the parameterization emerge simultaneously from a global numerical optimization process. Given two orthogonal piecewise linear vector fields, our method computes two piecewise linear periodic functions, aligned with the input vector fields, by minimizing an objective function. The bivariate function they define is a smooth parameterization almost everywhere, except in the vicinity of the singular points of the vector field, where both the vector field and the derivatives of the parameterization vanish. Our method can construct quasi-isometric parameterizations at the expense of introducing additional singular points in non-developable regions where the curl of the input vector field is non-zero. We also propose a curvature-adapted parameterization method, that minimizes the curl and removes those additional singular points by adaptively scaling the parameterization. In addition, the same formalism is used to allow smoothing of the control vector fields. We demonstrate the versatility of our method by using it for quad-dominant remeshing and T-spline surface fitting. For both applications, the input vector fields are derived by estimating the principal directions of curvatures. Implementation is available in Graphite . 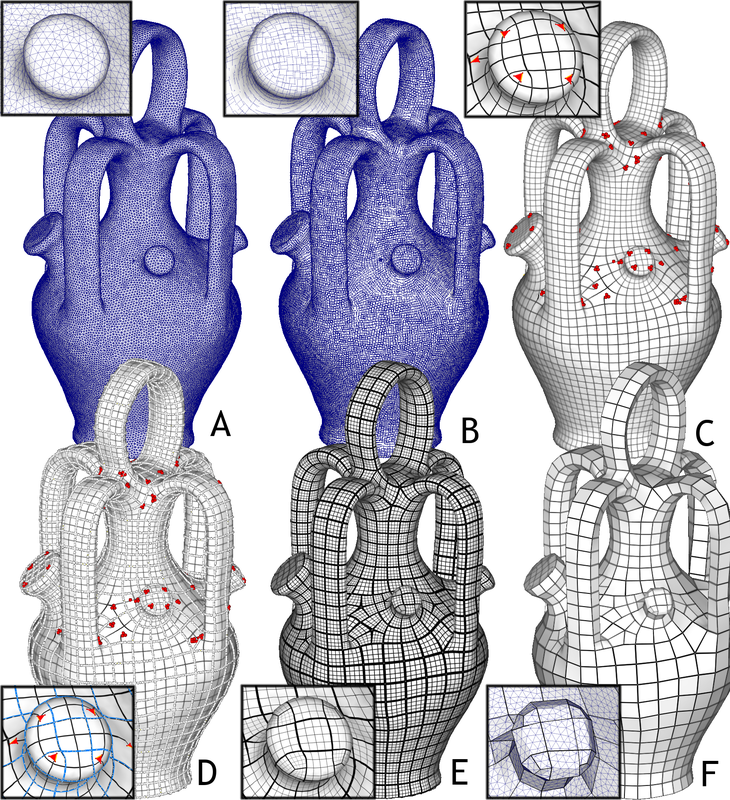 The idea of modified Tutte/Floater conditions for parameterizing objects of arbitrary genus appears in: Dvir Steiner and Anath Fischer, Planar Parameterization for Closed Manifold Genus-g Meshes Using Any Type of Positive Weights, JCISE, Vol. 5, No. 2, June 2005. Link to Anath Fischer's publications. A more recent paper uses the same idea as Steiner and Fischer (with the addition of N-Symmetry to allow singularities of indices k/4, with a formulation similar to ours): Designing Quadrangulation with Discrete One-Forms (on Mathieu Desbrun's team page). 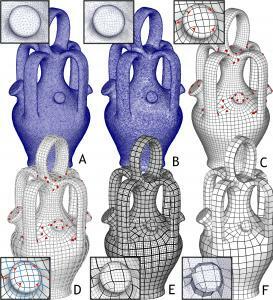 ... and a similar idea, nicely generalized in 3D for hexaedral-dominant meshing: Volumetric Parameterization and Trivariate B-spline Fitting using Harmonic Functions (Tobias Martin, Elaine COhen, Mike Kirby, SPM 2008). The problem of mesh quadrangulation (equivalent to global parameterization) is attacked from a completely different point of view (using spectral methods) in: Spectral Surface Quadrangulation , S. Dong, P-T. Bremer, M. Garland, V. Pascucci, and J. C. Hart, SIGGRAPH 2008. We discuss spectral methods (including that one) in this paper. Dong and Garland's spectral method was later refined to take more geometry into account. See Spectral Quadrangulation with Orientation and Alignment Control , Jin Huang, Muyang Zhang, Jin Ma, Xinguo Liu, Leif Kobbelt, Hujun Bao, SIGGRAPH Asia 2008.